Are People with Asthma and COPD treated Similarly? Asthma and chronic obstructive pulmonary disease (COPD) are not the same disease, but they do have similar symptoms. Asthma usually presents in childhood and early adulthood, and COPD usually affects people who smoke or used to smoke. COPD usually presents in a smoker/former smoker in his/her mid forties and early 50s. Asthma is usually triggered by irritants that are in the air, but can also be triggered by intrinsic factors, and also the occupational environment. Asthma and COPD are completely different illnesses that can have similar symptoms in the individuals. 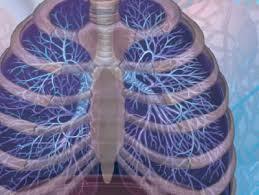 There are different types of COPD; one form is emphysema, and the other form is chronic bronchitis. If you have COPD you may have a combination of both forms of COPD. Asthma and COPD can coexist in the same person. Many people with COPD are treated as though they have asthma. Some of the same medications used to treat asthma are used to treat COPD. 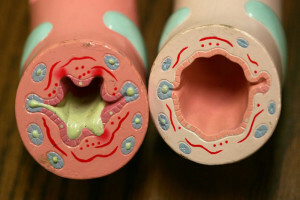 People with asthma and COPD are often treated with an inhaled corticosteroid, such as Flovent. It is possible to get COPD if you are not a smoker. Some children are born without an enzyme, which can cause them to develop COPD. Just as there is no cure for asthma, there is also no cure for COPD. Many of the same irritants that make asthma symptoms worse, can also exacerbate the symptoms of COPD. Just as with asthma, you may have coughing and production of mucus with COPD. There are manifestations of COPD that occur in individuals that don’t manifest with people with asthma. With COPD there is sometimes swelling of the feet and ankles due to cor pulmonale, or right heart failure. Cor pulmonale is a complication of COPD that is caused by heart and pulmonary insufficiencies. Much of the congestion and mucus from COPD is caused by pulmonary insufficiency, which is much different from asthma. Asthma is treatable. With proper treatment and lifestyle changes you can lead a fairly normal life without any symptoms of asthma. Individuals with COPD hardly ever go a day without symptoms. For instance, slight exertion can create shortness of breath in a COPD patient. With healthy lifestyle, a COPD patient can see some recovery of lung function, but a pulmonary function test will show the presence of pulmonary problems. Many people with COPD can lead fairly normal lives if they improve their lifestyle early enough. Lifestyle plays a big role in asthma and COPD. Obesity can affect asthmatics and people with COPD similarly, but the symptoms may be worse in the person with COPD. If you are 100 or more pounds overweight, and you have COPD you may not be able to walk and breathe at the same time. Just going to the toilet can tire you out to the point that you either lay in bed all the time or sit in a chair. Immobility can make both asthma and COPD worse. Losing weight can help improve asthma symptoms, and it can greatly improve the shortness of breath associated with COPD. The commonality between asthma and COPD is that you experience breathing problems. If you have coughing, shortness of breath, see your doctor before you get too sick. It is easier to get well before your immune system gets so weak from fighting an illness. Whether you have asthma or COPD, you are at risk of getting respiratory infections, due to a weakened immune system. You may have asthma and COPD at the same time; it is very important to follow your doctor’s plan of care for your daily life. A weakened immune system could put you at risk for other illnesses, such as the flu and pneumonia. To stay as well as possible, it is important to live a healthy lifestyle, and to keep your follow up visits to your doctor. Your doctor may suggest that you get a flu shot, and pneumonia shot to protect you from developing a serious illness that could put your wellbeing at risk.